I love Halloween. It's my favorite time of year. I think my favorite part (or the part that I look forward to the most) is pumpkin carving. 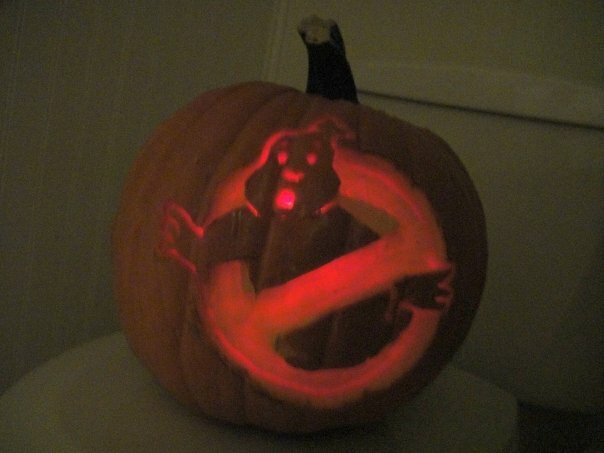 Ghostbusters logo pumpkin, 2007. And yes, it is sitting on a toilet! I love to play with light with my pumpkins, so every now and then, I have to look at it in the dark so I can see how the image is coming along. The downstairs bathroom has no windows so I usually go in there to check on my pumpkin. 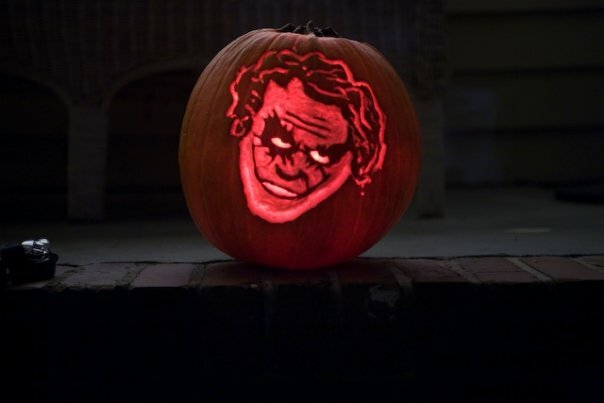 Joker Pumpkin, 2008. There was no contest that year who would be on my pumpkin. I LOVED "The Dark Knight" so Heath Ledger it was. Unfortunately, I made a few mistakes like the jawline. This was the first year I used a Dremel and thankfully, I've gotten better at it. Even though it's pretty dumpy looking, at least you can tell who it is! 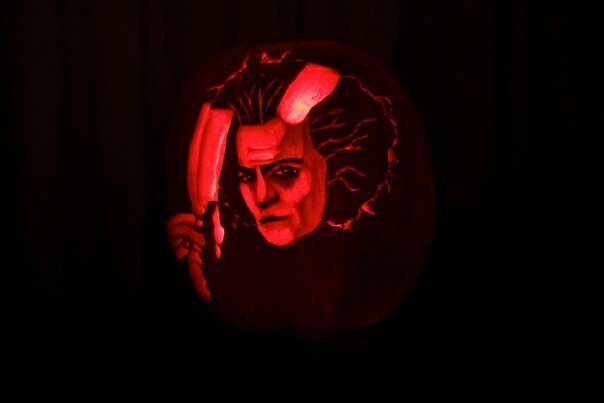 Sweeney Todd Pumpkin, 2009. This is by far my favorite out of all of them! This one isn't perfect either, but I couldn't be happier with the face (and what a face you have Johnny Depp! Purrrrr . . . ). To be quite honest, I'd like to think I grew a lot in my carving skillz . . . but part of me thinks this was just pure luck that the pumpkin came out so great! LOL. Not sure if I can do better than this one . . . I FINALLY got to see this movie on TV last week and I loved it. If you have a problem with blood or cannibalism in general, I would suggest you skip it! :) It's all in dark fun but I can see how a lot of people can't handle it. If you get to ever see the show on stage I would recommend it. It's not as bloody as the movie and the music is amazing. This year, I caught a pumpkin carving contest on the Food Network. (Click here for the dates and times for other showings of the Challenge--it's really great!) The pumpkins were amazing. I usually do a souped up jack'o lantern, meaning I play with light to make the images. In daylight, you really can't tell what the pumpkin is supposed to be. Well, during this challenge, they had a 3D category where the contestants had to sculpt a pumpkin just like you'd sculpt clay or marble. So, instead of carving the negative of the picture, they were sculpting the thing itself. I was so inspired I decided I'd sculpt one this year. A few days later, I was driving past a local church and saw they were selling pumpkins. I spotted a white one and instantly had the idea to sculpt Voldemort! How creepy would a white Voldemort pumpkin be? Well, let's find out . . . Someday, when I get better and faster, I'm totally auditioning for that Food Network pumpkin Challenge. I was so excited to see that there was a competition that I actually have a chance of competing in! Someday . . . but for now, I need to practice. Even though I already sculpted a pumpkin I still want to carve one this year. One final link if you're interested in taking your pumpkin to the next level: Zombie Pumpkins. This website is full of great tips, tools and templates to download. I've never used a template before but I've heard these are the best. If you want to freehand your own pumpkin, make sure you pick a design that has a lot of contrast (i.e., one that has lots of white and dark spaces). Cut a hole in the bottom (I prefer the bottom because it makes the overall pumpkin look cleaner and no light can escape . . . your design needs all the light it can so it can be nice and bright. Scoop out the guts, then take a scraper (a large, metal kitchen spoon works well) and scrape EVERY last string or seed out. This will keep your pumpkin from rotting faster or catching on fire (if you're using a candle). Next, I use a Magic Marker and sketch my own design (above is my marker version of the Sweeney Todd one). If I make a mistake, I just wipe it off with a damp cloth. Once I'm happy with it, I go over it with a red Sharpie (black is too dark and will make your pumpkin look messy). Then, I cut away! The lightest parts of the picture require the most light, so you cut deepest in those sections. Carving at various levels of depth provides texture and complexity to the design. My little one checking out his mommy's work. In this picture, you can see the different depths I carved into the skin. Even though it doesn't look like much in the light, in the dark, the light shines through and creates all sorts of shadows. Dig deep for the light areas, and leave the skin on for the darkest regions. For shades of gray, use various depths in between.